A swamp is a bad place to live in tents. Mud turns to rivulets or dirty streams when rains come, breeding mosquitoes and the diseases they carry. Thin mattresses soak through, leaving people to sleep in water teeming with waste. For as many as 70,000 people in Bentiu, in South Sudan’s northern Unity State, this has become the norm. Since 2013, the country’s protracted civil war has forced residents to flee their homes as armed groups attack towns with extreme brutality. But without an entrenched, well-planned emergency infrastructure that can handle the displaced, internal refugees have been forced to head to the nearest United Nations camps. These sites have sprung up in some inhospitable places in a makeshift effort to give some protection to an increasingly vulnerable population. In Bentiu’s case, a camp was built under emergency conditions in a wetland. And when the rains come, life in the swamp becomes exactly what you might imagine: miserable. 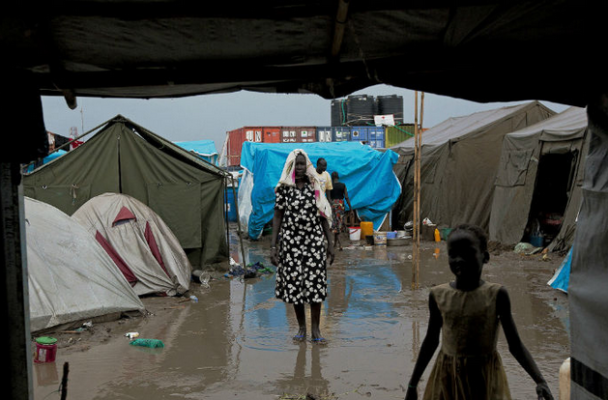 In midsummer of last year — the height of the rainy season in South Sudan — things got so bad for the displaced in Bentiu, “people were living knee-deep in floodwater contaminated with raw sewage,” Doctors Without Borders reported. “Many slept standing up, their children in their arms.” Some simply had to flee. Again. The number of people infected with malaria rose, and 175 latrines collapsed, increasing the threat of a cholera outbreak. The refugees in Bentiu weren’t alone. By mid-August, the U.N. Office for the Coordination of Humanitarian Affairs estimated that about 70 percent of the 1.3 million people displaced by war in South Sudan were living in flood-prone sites. What the Bentiu camp faced is being called a “toxic cocktail” by the authors of a new report on displacement due to natural disasters, published by the Geneva-based Internal Displacement Monitoring Center on Monday. That label refers to what happens when people displaced by war end up being struck again, this time by Mother Nature. “It’s rare in sub-Saharan Africa that someone is displaced only once,” says Alexandra Bilak, the head of policy and research at the center and one of the authors of the report. Populations struck by both war and weather are hardly confined to Africa, however. More than 70 percent of areas affected by severe flooding in Bosnia in 2014 had been laid with landmines during the war in the early 1990s, and 700 homes belonging to refugees were destroyed, the government’s Deputy Security Minister Mladen Cavar told Deutsche Welle. And in Afghanistan’s Helmand and Herat provinces, a third of displacements in 2014 were due to the combination of ongoing conflict and drought or other natural disasters.